Harrison is Where the Trail Meets the Lake. 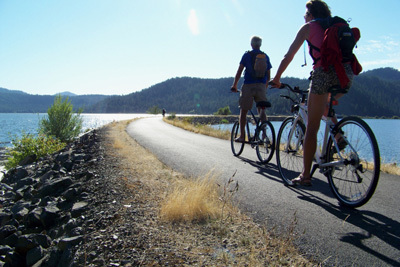 The bike trail, Trail of the Coeur d'Alenes runs through town between the city park and public beach and marina. You can enjoy this trail and many others during your visit to Harrison - cycling and mountain biking through the nearby oasis of lakes, rivers, and mountains. 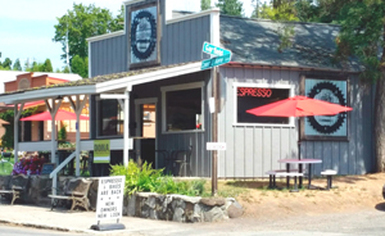 Harrison is a mecca for cyclists and roller bladers on the Trail of the Coeur d'Alenes. 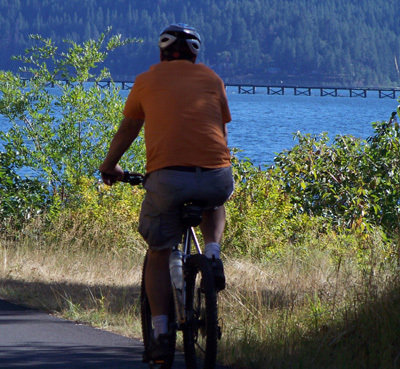 This 72-mile paved rail-trail stretches across the Idaho Panhandle from the Coeur d'Alene Indian Reservation in Plummer, to Mullan, a few miles from the Montana border. The Harrison trailhead is at mile 15.3. You can find helpful answers to many Frequently Asked Questions about the trail on the Friends of the Coeur d'Alenes Trails page, and the Trail of the Coeur d'Alenes guidebook page. 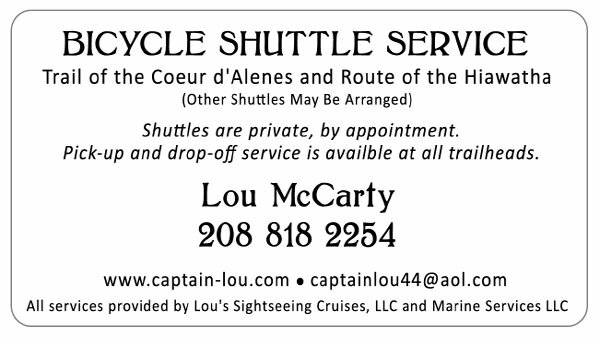 You can also post inquiries on the Trail of the Coeur d'Alenes Riders facebook group. Two of the main things people want to know are how much it costs to ride the trail and where to get a map. Riding the trail is free. You can start planning your trip by downloading some ﻿trail maps﻿. For those who come by car to ride the trail from Harrison, trail parking is available on Lakefront Ave., across from One Shot Charlie's, overlooking the Harrison campground. The large parking area down below is reserved for campground guests, boaters, and customers at the Gateway Marina. The only exception is that those with a disability placard should drive down the hill toward the beach and park in the disabled spot right next to the trail entrance. As an alternative, the Springston Trailhead is an easy four-mile drive from downtown Harrison. It includes an accessible restroom and 13 parking spaces with one ADA. This parking area rarely fills up. 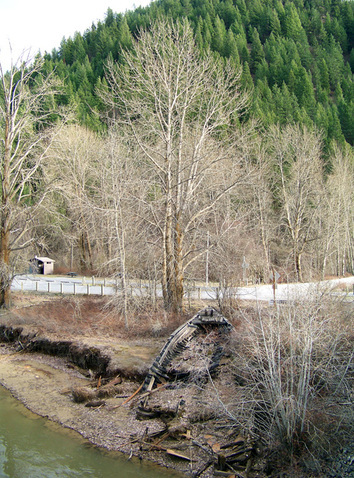 To get there, head north on Hwy 97 and cross the bridge two miles from town. Turn right onto Blue Lake Rd. From there it's 1.8 miles east to Springston Bridge. Turn right over the bridge to the trailhead parking area. Guests at Lakeview Lodge can make arrangements to leave their cars parked there over night while riding the local trails. Keep an eye out for moose on the stretch of trail east of Harrison! A variety of cycle and equipment rentals is available at The Cycle Haus, formerly Pedal Pushers Bike Rental & Repair. This business changed hands in winter of 2016. They serve riders with cycle rentals and repairs, accessories, retail, and espresso. Look for expanded hours. The shop is located on the intersection with the historic brick Grant Building, Harrison Trading Post, and the city park. Harrison's full service cycle rental and repair shop; and coffee! Photo courtesy of the Cycle Haus. The approach to Heyburn State park seven miles south of Harrison. Photo by Estar Holmes. 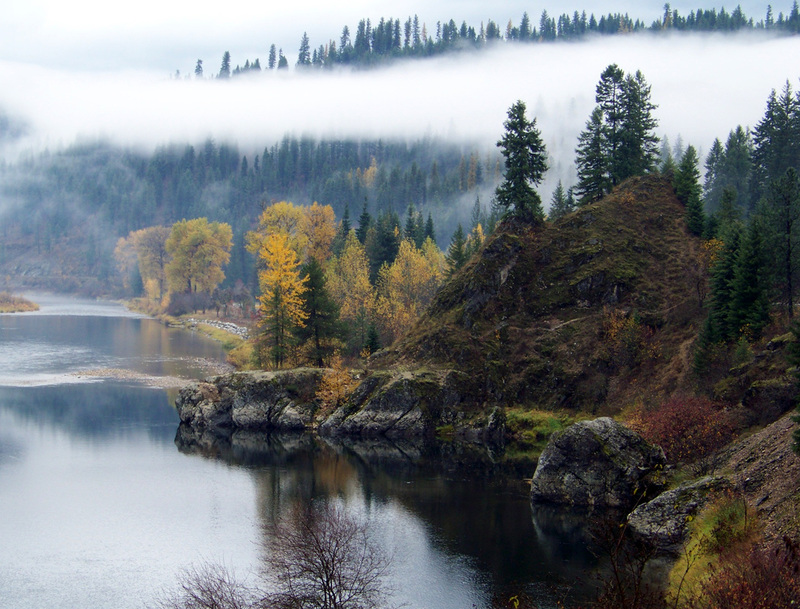 For a full day's cycle trip, ride the Trail of the Coeur d'Alenes northeast along the Coeur d'Alene River to see the displays at Idaho's oldest standing building, the Coeur d'Alene's Old Mission and the fascinating Sacred Encounters multi-media museum near Cataldo. The museum is not right on the trail, but it's about three miles west -- a flat and easy ride from Cataldo's Mission Inn restaurant. (Make sure to stock up on drinking water because there is none available for the 30-mile stretch between Harrison and Cataldo). Watch for moose along this area. Highlights of a family cycling trip on the trail with three young boys. 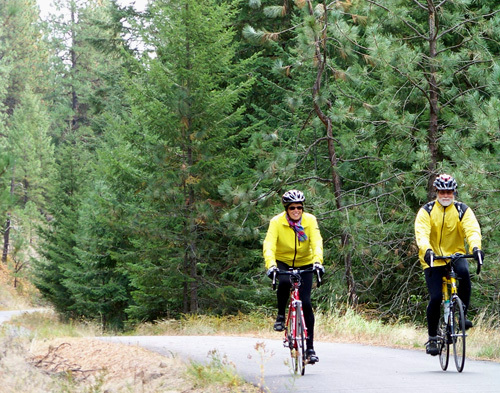 In 2010, the Friends of the Coeur d'Alene Trails created a loop of rail-trails and multi-use roads that form the 300k Bitterroot Loop. 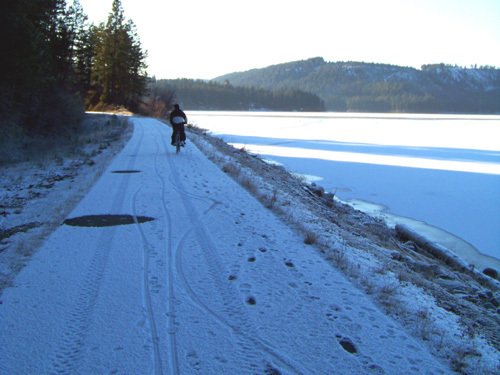 It connects the CdA Trail with the Route of the Hiawatha and the Old Milwaukee Route through Avery, Idaho, and along the scenic St. Joe River to St. Maries and Heyburn State Park. Old Milwaukee Road portion of the Bitterroot Loop, along the St. Joe River. Photo by Estar Holmes.